G’day TAY, so the extended theme week is all about game worlds. Instead of doing the game world I would like to live in. Let me recount a little story that a lot of you have probably experienced in some form or fashion yourself. It was the late 90’s, storytelling in games was usually reserved for JRPG’s, and a lot of them went with pretty tropey stuff. We had already seen Final Fantasy VII and Ocarina of Time at this point, so the story telling powers of video games were pretty much in puberty at least. For me personally, games were about injecting myself and playing the hero. Ocarina of Time was the game that truly cemented my love of games. Having grown up with the NES and the SNES, Ocarina of Time came out in my teen years. Not only was I exactly ripe for more meaningful stories, I also at this point had mastered English enough to have a good grasp on the narrative. So when Zelda hit the Gameboy Colour, I immediately rectified the hole in my Zelda completed list, and set off on my adventure. The game opens with –insert your name here- otherwise known as Link, on a boat in a storm. Lightning strikes the boat and Link is washed up on a shore. The game then opens with Link in a bed, waking up to friendly faces who rescued Link. Our hero goes back tot he beach to find his belongings, and only finds a sword on the beach. An owl comes flying in and tells Link he needs to go questing. Now, the questing itself is fairly rote, if you want to get home, wake the windfish and be on your way. Link sets out, discovers he needs eight McGuffins in order to wake this windfish that are hidden in eight dungeons (wouldn’t you know). And the game is fully on. 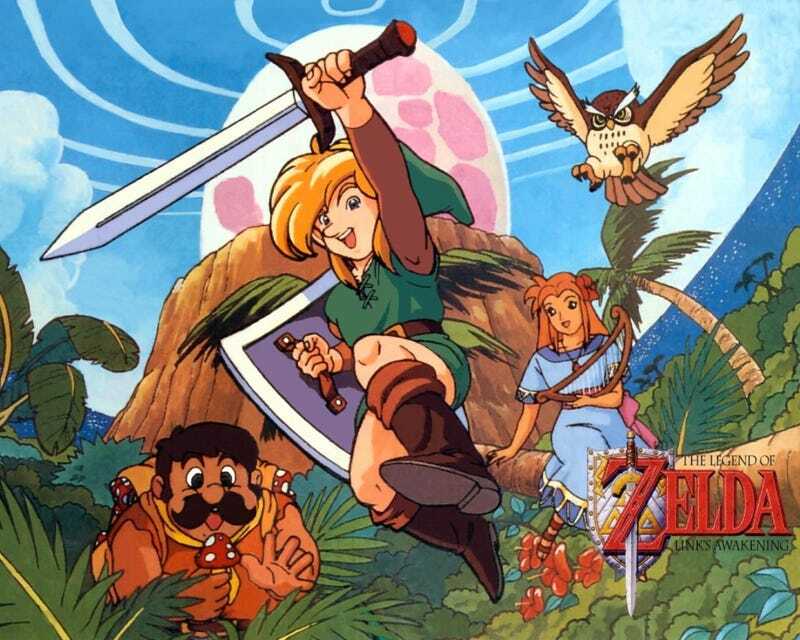 At this point, it’s Zelda as you love it on Koholint Island. Koholint island is probably the only video game land that moved me to contemplate my sense of heroism. As you progress through the game, most of it feels standard Zelda fare, some elements are a bit wacky though. You find a Yoshi doll early in the game, and the wind fish sleeps in a giant Yoshi egg. You bust Goomba’s in 2D sections and there are cheep-cheep in the waters. There are talking animals and one Island inhabitant calls you up on the phone, you find a certain doctor Wright (of Sim City fame) in a hut. These all feel like funny easter eggs. They are not funny easter eggs. After the fourth or fight dungeon. Link finds himself in some ruins. The ruins have omynous music playing. You delve deeper until a mural explains the twist in a pretty straightforward fashion. Koholint island is the dream of the wind fish, if you wake the wind fish, the dream is over and Koholint will be no more. At this point in the game, my young teen mind went numb. Do all these loveable characters die? Surely not, I have to wake the wind fish, it’s the only thing I can do on the island. Link shares an initmite moment with Marin (the girl who rescued Link from the beach) where Marin contemplates on the world beyond the waves. On Link goes to wake the wind fish. An evil nightmare is plaguing the creature, which is the source of all the monsters on the island. Link proceeds to find the McGuffins, slays the nightmare and wakes the wind fish. As the credits roll, Koholint Island disappears. It was all true. In the end sequence, we see Link hang on on a log from his wrecked boat. Link wakes up, sits on a piece of wreckage and contemplates his current status. Link has nowhere to go, and might die alone on the sea. The end. The fact that Koholint was a dream was made real to me by the ending, but the latter half of the game had me feeling guilty about pursuing my own agenda. I had to wake the wind fish, in the end, there was even a “justified” reason (slaying the nightmare). But while Link saved the wind fish, he destroyed an Island with loveable inhabitants, and might have doomed himself to drifting in the sea to his death. Koholint island made me contemplate the nuances of bravery and heroism, in a time when meta-communication in game narrative had only begun to take full shape. (yes environmentalist Final Fantasy VII I acknowledged you before.) Koholint island made me feel bad for trying to be the hero. Koholint island made me think in a more adult fashion about narrative, kudos you 8-bit wonder.